Purchasing a Christmas gift for those important women in your life is often a difficult task. Typically, shopping is a painful experience, because most gift ideas have been exhausted throughout the year. Though it would be simple to purchase a box of chocolates, this kind of present does not always represent the true sentiments we wish to impart to our loved ones. To find a gift that captures true thoughtfulness and love can be arduous. 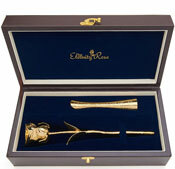 In the US and Europe, men are rapidly learning how much the women in their lives love to receive an Eternity Rose as a unique and romantic gift. 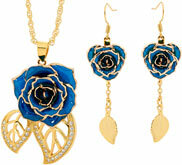 While fresh roses are the ultimate symbol of love, their beauty quickly fades. With an Eternity Rose, the beauty of the rose is evident, and, coupled with the concept of elegant jewelry, it will endure forever. On Christmas, there is no better gift than a gold, platinum, or silver-dipped rose, or a glazed rose in her favorite color, presented in a classy leather case, or a stylish vase. This beautiful gift can be proudly displayed for an eternity. There is no simple way to describe these gorgeous Eternity Roses without seeing them for yourself. However, if you find that the product does not meet your satisfaction, you may return the rose within 90 days, and we will fully refund your money with no questions asked. This is how completely sure we are that you will be thrilled with your purchase. 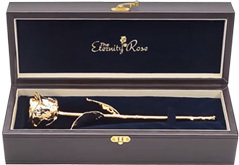 An Eternity Rose is guaranteed to be the absolute most unique and beautiful present she will have ever been given, and if Christmas has already passed, keep us in mind for a Valentine’s Day Gift or even for her Birthday. Though purchasing gifts for women can be difficult, it can be more so for men. Ties, underwear and other clothing can be boring gifts. These gifts do not take a lot of thought and are typically not remembered with fondness. 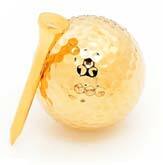 If the man in your life loves golf, The Eternity Rose 24 karat gold-plated golf ball and tee set is the perfect gift, and one he will always remember. For men who love playing Poker, there is a full deck of gold-plated playing cards. This unique gift can be used in a fun game of cards, or proudly displayed as a conversation piece. These gift ideas are not inexpensive novelty items. 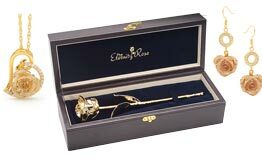 Just like our preserved roses, each gift set for men is crafted through elaborate processes to produce exquisite creations. And they also make fantastic Gifts for Father’s Day. The Eternity Rose team would like to wish you all a very Merry Christmas. We sincerely hope that you will enjoy giving our special gifts as much as we enjoy crafting them!